Blogging for 10½ years has led the garden along many paths. Many shades of green and foliage plants have given way to colour and a variety of flower shapes in the borders. Taking photographs goes hand in hand with blogging and with the flowers came pollinators and many photo opportunites. Happy to be doing my bit in helping these polinators with the plants I was now choosing, I felt I was being a responsible wildlife gardener. I was now introducing ‘border friendly’, reasonably well behaved, wild flowers too. My garden style is now unrecognisable from what it was 10 ½ years ago. 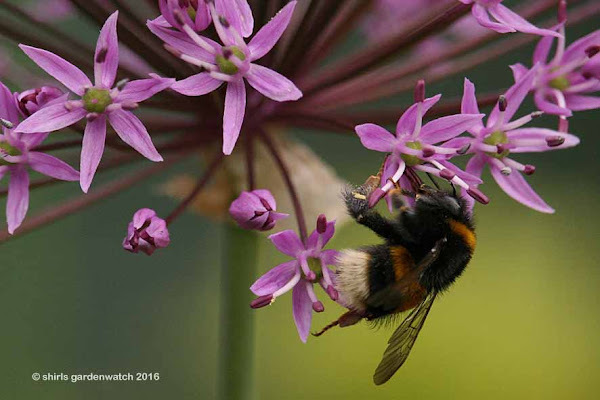 Bee feeding on Allium ‘Purple Sensation’ planted as bulb. However, as I wait in anticipation for the others flowering something is spoiling the good I thought I was doing for wildlife - with other plant purchases over the last few years too. Something properly took the edge of my visit to the main gardening show here in Scotland, Gardening Scotland, just 30 mins before I walked out the door. 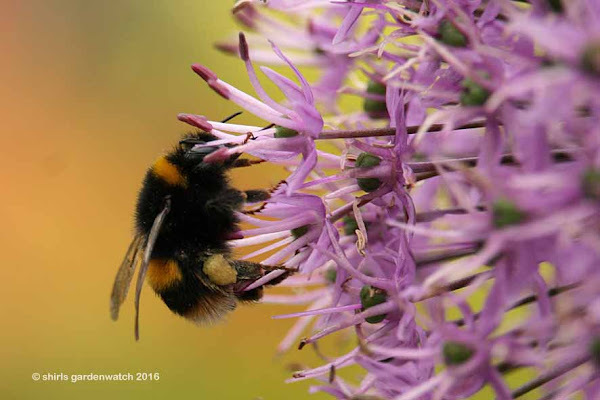 Eagerly anticipating the plant choices available at Gardening Scotland's sales tables, from nurseries around the UK, I had a small list of plants to look out for – all with pollinators in mind. A sadness came over me when I thought about my list and all the plants that would be going home to gardens over the three days of the show. Following a link on one of my blog comments caused this sadness I felt going to the garden show. I genuinely didn’t embrace the show in the same way when I got there. I didn’t feel like plant shopping either but did eventually succumb to two small purchases - a hardy orchid (Dactylorhiza) with two flowering spikes and a perennial Osteospermum. Bee feeding on flowers of herb Chives, planted pre blog. 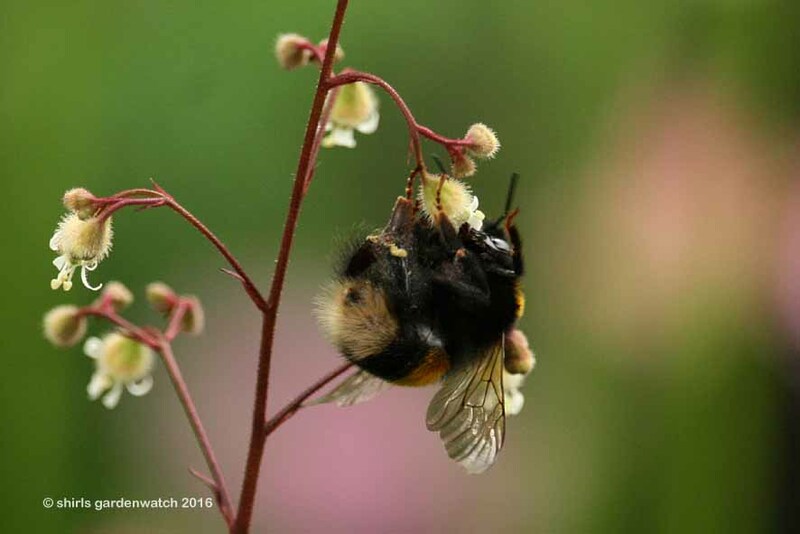 It was suggested that I could reblog the issue of concern raised but with it coming up on Day 2 of this series of #30DaysWild I felt I should blog myself at some point over the month of June - my only pre planned post. Bees caught my camera eye before I made our evening meal tonight and I knew instantly what I would be blogging about. The concern is of Neonics used by commercial growers. When we buy plants, in good faith, with labels suggesting they are perfect for pollinators they could have neonics in the soil which would be toxic to insects. How would we know? Well, Julie at GARDENING JULES is trying to create a list of UK Nurseries and Garden Centres that don’t use neonics. It’s not going well. She has a lots of info on this issue on her blog post of June 1st, Wildlife Wednesday – A Perfect Storm. She mentions a few people of note too. I’ll also add the crowd funding appeal link to Dave Goulson. Julie's post is definitely worth a read - there are many comments. Bee feeding on tiny Heuchera flowers, planted pre blog. Perhaps I’m not helping the bees and other pollinators with my plant purchases then? I’d hate to think I was adding toxins to my soil which in turn would harm wildlife. That really goes against everything I have been gardening and blogging about. Through my blog I have embraced gardening for wildlife - I thought I was doing well. On listening to Dave Goulson’s video, it seems it takes years for the soil to recover. That being said then, the bees shown in this post shouldn’t have come to any harm tonight as these plants have been in my garden, many, many years. Bee feeding on Cirsium rivulare 'Atropurpureum', planted pre blog. What is the answer meantime? There are millions of plants for sale in the UK every day of the week. Clearly more research and legislation will be required before there are 100% guarantees that plants are clean of neonics. Perhaps, the initial study Dave Goulson is trying to raise money to do will show the problem is not as widespread as feared. Monitoring plant sales is another matter though – what about car boot sales at the other end of the spectrum? A comment below asks if growing from seed is the answer. I can’t say, but could guess that is a possibility. However, not everyone has the space (garden size, cold frame or greenhouse) or patience (some plants take a few years to flower) to grow plants from seed. 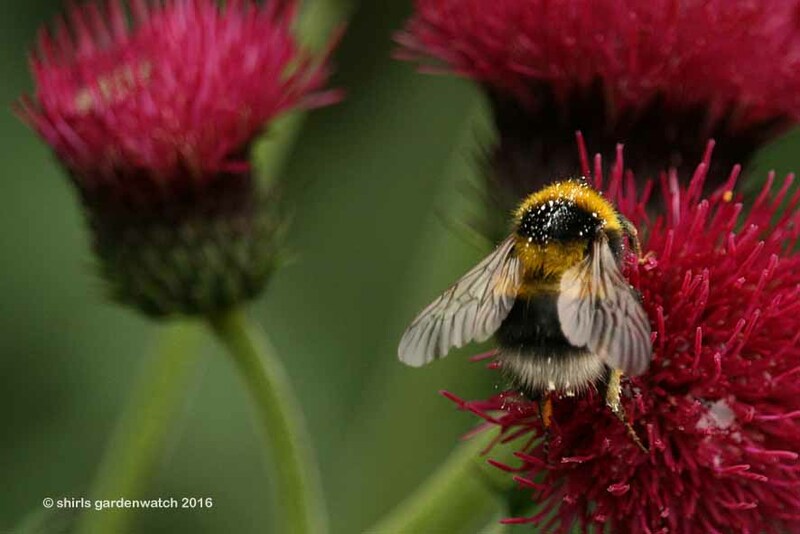 What do the pollinators like bees, that seriously need garden flowers to help their decline, do if we stop buying plants from nurseries and garden centres while debates go on? That’s not a good outcome either. So is the answer to grow from seed? These issues are very thought provoking Shirley and can honestly say not one I've given much consideration to over the few years I've been gardening. Personally I don't have the facilities to grow many plants from seeds. This would me also leave me with the dilemma of just what to do about planting. How far do we take this problem? For example. We can be diligent until the cows come home and as wildlife friendly as possible but we can't control our neighbours etc. so if they use chemicals the bees/wildlife are inevitably going to visit their plants on the way to visit ours it won't matter what we do. I think providing we do our best then we should not feel quite so guilty. On a cheerier note, your pictures are amazing. Sue, maybe, it would make sense to me that would be ok. I changed my post end to reflect some more. Thanks for adding your voice to the debate Shirley. Something we can all do is ASK when buying plants and perhaps if the garden centre doesn't know the answer tell them we'll buy when they find out. Small independent nurseries may be less likely to use these chemicals; the large garden centres who buy from where millions of plants are produced only care about a quick turnover so perhaps by supporting the smaller growers who don't have the same need as they don't have a mono culture it will help the bees and other pollinators and encourange independent growers. Sue, Yes, I hear you, although what happens with perennials, shrubs, hedging and trees. I agree too about smaller nurseries and propagation but sadly that will be more of a cost issue to them I guess. Compromises certainly need to be made. Christina, I couldn’t not say something. Asking about the source of plants is the option I would expect here. Could I do that, when I have a very limited number of nurseries in my area? I don’t know. We are talking about it, that’s a serious start. Awareness is good. You and others have reblogged a strong post by Julie too which is great. 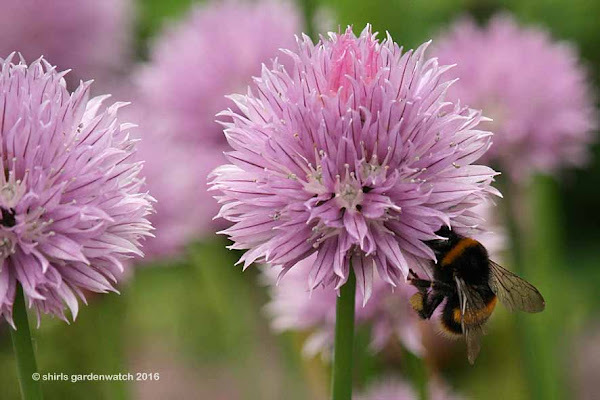 Enjoy your summer watching the bees in your garden – if you can.